Grunig and Hunt (1984) developed four models of public relations that describe the field’s various management and organizational practices. These models serve as guidelines to create programs, strategies, and tactics. In the press agent/publicity model, communications professionals use persuasion to shape the thoughts and opinions of key audiences. In this model, accuracy is not important and organizations do not seek audience feedback or conduct audience analysis research. It is a one-way form of communication. One example is propagandist techniques created by news media outlets in North Korea. The public information model moves away from the manipulative tactics used in the press agent model and presents more accurate information. However, the communication pattern is still one-way. Practitioners do not conduct audience analysis research to guide their strategies and tactics. Some press releases and newsletters are created based on this model, when audiences are not necessarily targeted or researched beforehand. The two-way asymmetrical model presents a more “scientifically persuasive” way of communicating with key audiences. Here, content creators conduct research to better understand the audience’s attitudes and behaviors, which in turn informs the message strategy and creation. Still, persuasive communication is used in this model to benefit the organization more so than audiences; therefore, it is considered asymmetrical or imbalanced. The model is particularly popular in advertising and consumer marketing, fields that are specifically interested in increasing an organization’s profits. 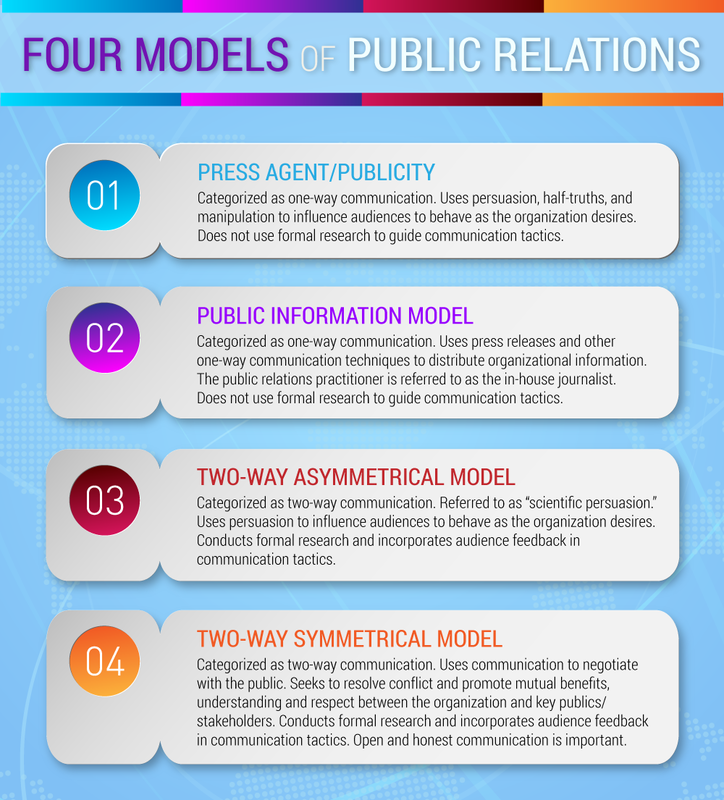 Finally, the two-way symmetrical model argues that the public relations practitioner should serve as a liaison between the organization and key publics, rather than as a persuader. Here, practitioners are negotiators and use communication to ensure that all involved parties benefit, not just the organization that employs them. The term “symmetrical” is used because the model attempts to create a mutually beneficial situation. The two-way symmetrical model is deemed the most ethical model, one that professionals should aspire to use in their everyday tactics and strategies (Simpson, 2014). Some experts think of public relations more broadly. For instance, they may argue that political lobbying is a form of public relations because lobbyists engage in communication activities and client advocacy in order to shape the attitudes of Congress (Berg, 2009). However, this book focuses on a public relations approach based particularly on writing for the media. Furthermore, the goal is to disseminate communication based on the two-way symmetrical model presented by Grunig and Hunt (1984). Previous: What is public relations? Next: Why do companies need public relations?